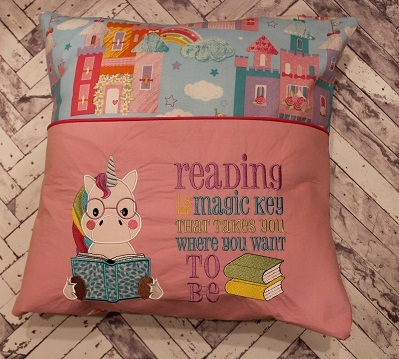 Get comfy and cozy with your favorite book and this Unicorn reading pocket pillow. This custom made character pillow has a front panel pocket that holds a book. For an extra special touch, front panel pocket can be personalized with your little one's name in a coordinating color. Front panel design is a combination of custom embroidery and applique technique. Indicate One Font Color Choice-Please refer toThread Color Chart *If no color is selected, store owner will make color choice.